Reliefgoods.org aims at revolutionizing the procurement of relief goods in humanitarian crises and disaster events by providing a digital platform that enables all humanitarian stakeholders to correspond to disasters in real time and highly efficient. Identify what products you will need and easily create requests for quotes to send out to suppliers. Choose from a variety of quotes from regional, national and international suppliers to find your best match. Organize your daily procurement business efficiently to save lead time and costs by avoiding ad hoc decisions. Quickly react by mobilizing your network and react to demand fluctuations during and after disaster events. Reliefgoods gives your organization the flexibility to adapt to fundamental changes in your procurement routine. Suppliers benefit from the enhanced ability to scope with shifts in demand and a broad access to requests for quotes. 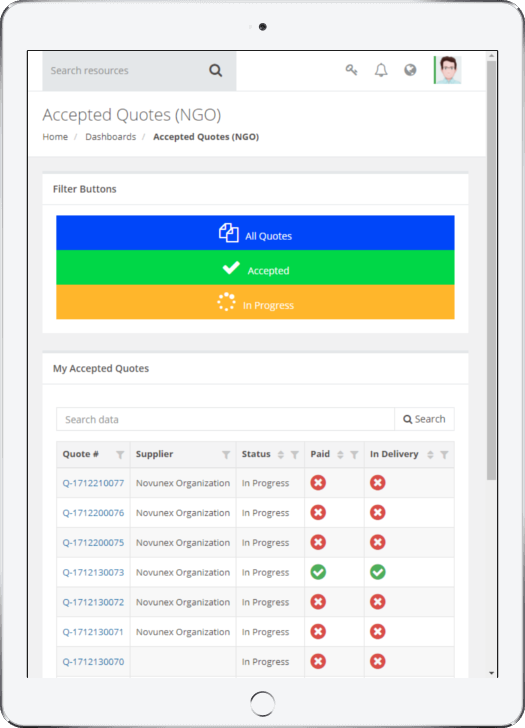 Reliefgoods.org gives your organization the flexibility to adapt to fundamental changes in your procurement routine.